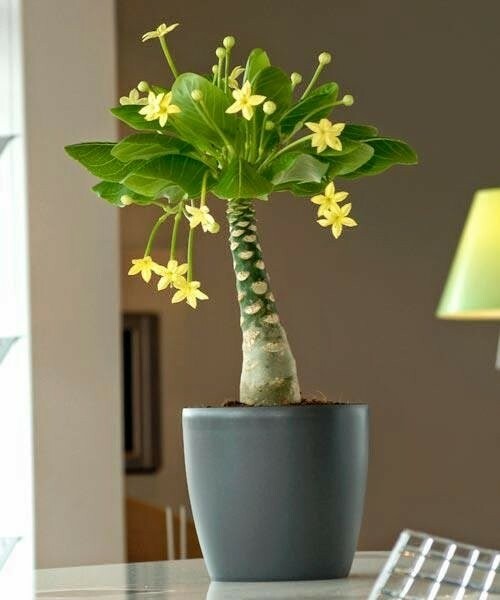 Also known as the Vulcan Palm, the Hawaiian palm (Brighamia insignis) has a thick succulent trunk to retain moisture during dry periods, making it a very unusual and decorative houseplant, or even for growing on the patio in summer. New leaves form in the crown and the older, lowermost leaves turn yellow and wither. In its natural habitat of Hawaii very few of these exceptional and decorative plants remain, so by growing one you will be playing a part in it's conservation. The IUCN (International Union for Conservation of Nature) is working together with scientists and volunteers, on a survival plan. For every plant sold, a sum is donated to the IUCN. Pack of TWO plants, each supplied in an approx. 12cm pot with an overall height of up to around 40cms.